There is no shortage of options to choose from when it comes to selecting a ferry from Gili Islands to Bali. There are 9 ferry companies with a combined offering of 13 Ferry Routes connecting Gili Air to Serangan, Gili Trawangan to Serangan, Padang Bai, Amed, Sanur & Benoa Harbour, Gili Air to Serangan, Padang Bai, Amed & Sanur, Gili Trawangan to Serangan, Padang Bai, Amed, Sanur & Benoa Harbour, Gili Air to Serangan, Padang Bai, Amed & Sanur, Gili Trawangan to Serangan, Padang Bai, Amed, Sanur & Benoa Harbour, Gili Air to Serangan, Padang Bai, Amed & Sanur, Gili Trawangan to Serangan, Padang Bai, Amed, Sanur & Benoa Harbour, Gili Air to Serangan, Padang Bai, Amed & Sanur, Gili Meno to Sanur, Padang Bai & Serangan & Gili Air to Serangan, Padang Bai, Amed & Sanur. The fastest route between Gili Islands and Bali is Gili Trawangan to Padang Bai with a crossing duration of around 1 hour 15 minutes. With so many routes on offer we make it simple by comparing all similar routes in one search so you can quickly find what you are looking for. The Gili Islands are a small archipelago off the northwest coast of Lombok, an island in Indonesia. Fringed by white sand beaches, turquoise waters and tall palm trees, the Gilis comprise three slices of paradise, all with their own unique character. Trawangan, usually known as ‘Gili T’, is the most popular island, famous for its funky atmosphere and buzzing nightlife tailored to the backpacking community. Gili Air offers a more traditional Indonesian feel, whilst Gili Meno makes the perfect peaceful island getaway. Each island has superb snorkelling and diving opportunities, too, boasting some of the finest spots in South East Asia. There are also many dive operators where you can obtain PADI and SSI licences. 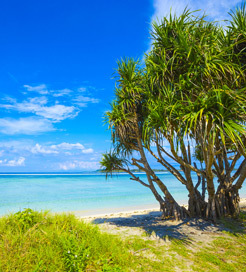 The Gili Islands are a popular destination for short excursions or as a stopover whilst travelling through Indonesia. From Gili Trawangan and Gili Air, there are frequent sailings to numerous ports on the east coast of Bali. Bali is one of the most popular and well-known island destinations in the world, situated between Java and Lombok in Indonesia. ‘The Island of the Gods’, with its ten thousand temples and beautifully varied landscape, is a dream destination for anyone from budgeting backpackers to the mega-wealthy. For a relatively small landmass, there are countless things to see, places to visit and backdrops to marvel at. Known for world-class surfing, exquisite beaches and luxury resorts, Bali is also characterised by forested mountains, idyllic offshore islets and picturesque rice fields. 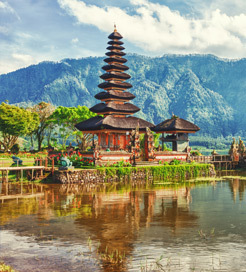 Two of the main towns are Kuta, in the south, which was one of the first tourist hubs, offering a buzzing nightlife, and Ubud, the cultural centre of Bali, acting as a slow-paced, spiritual retreat. Ferry travel is widespread in Indonesia, and it’s easy to reach Bali from numerous locations, with regular routes from some of the country’s most visited locations including Lombok and the Gili Islands.